The energy exchange for this delightful journey into inner peace is $100 for the 5 weeks. Yin yoga is a slow paced practice, with postures that are held for 3 -5 minutes in mostly seated or laying down positions, allowing the body to slowly release tension and penetrate the deeper connective tissues (tendons, fascia, and ligaments) as well as the energetic systems of the body, bringing the body into balance and increasing it’s natural range of motion. Yin yoga improves flexibility, circulation in the joints, the flow of qi; the subtle energy that runs through the meridian pathways of the body, which in turn helps improve organ health, immunity and emotional well-being. With this practice you will feel refreshed, renewed and restored. 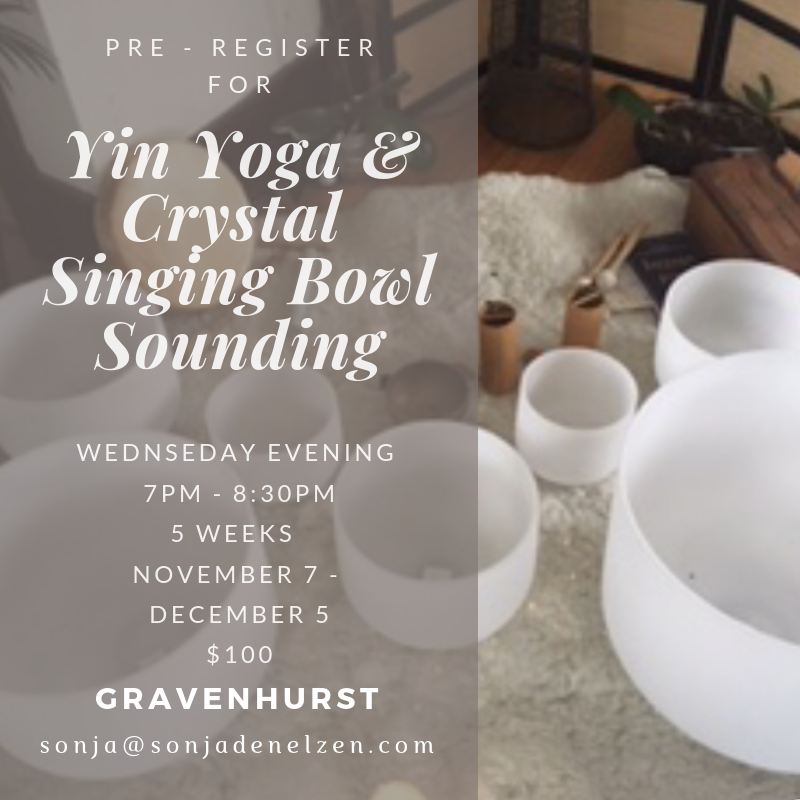 Each practice will be followed by a savasana (laying down with eyes relaxed and closed) while enjoying the healing vibrations of the crystal singing bowls. The energy exchange for this delightful journey into body, movement and breath is $100 for the 5 weeks. Vinyasa yoga is a series of sun salutations and asanas (postures) that we move through to connect the body and breath, to invigorate our health and well being. We work on getting into the postures in a way that is safe for your body. Book Private Yoga Lessons in Toronto or Muskoka area. If group sessions not available when you need them or you have a hectic schedule. You prefer more individualized one-on-one instruction. Practicing at home sounds more appealing to you. You are new to yoga and want an introduction to it before going to big class. You would like to learn yoga postures with healthy and safe alignment. You want to deepen your practice or develop a personal practice. You have a health concern or injury and would like a personalized practice to help you become more mobile. You would like more mental clarity and peace in your life. You would like more flexibility and strength. Whether you are just starting yoga or have been practicing for some time the one-on-one sessions are tailored to fit your needs. Sessions can be modified for all ranges of motion, ability levels and any age. Sessions can be modified to what you need that day, whether its a gentle yin session or a challenging flow, it’s for you to choose. Perhaps you would like to start going to a mysore room and are looking for an introduction to the ashtanga primary series. If you are just beginning we will explore the fundamentals and introduce you to the practice of yoga while helping you build a strong foundation so that you will easily transition into group classes. If you have some experience with yoga and would like to grow your practice we can explore specific asanas and fine tune your awareness and alignment in the postures. In your own home or we can arrange a studio for an additional cost, which ever is most appropriate for you. 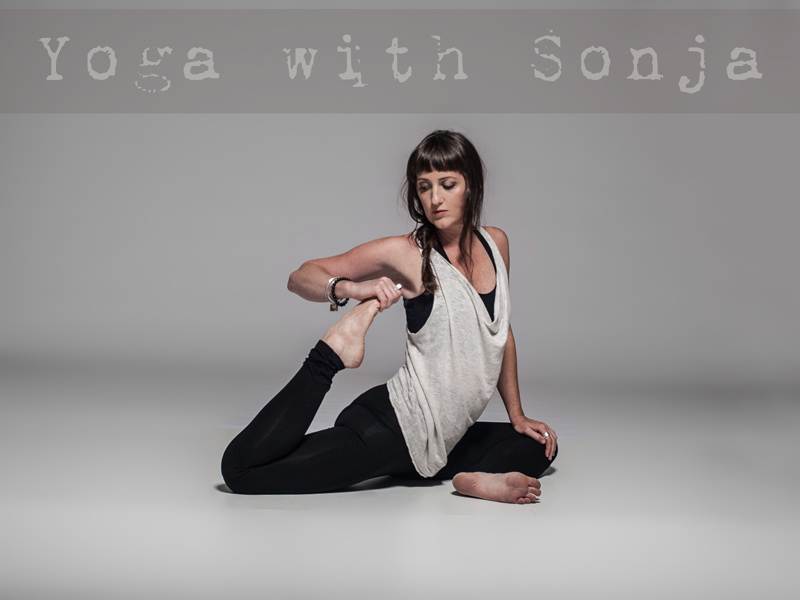 contact me at Sonja@sonjadenelzen.com to discuss what your needs would be for personalized yoga sessions. Ask me for the price of an additional person if you would like to ask a friend,co-worker, or significant other to join or about rates for groups or corporate yoga. Contact me at sonja@sonjadenelzen.com to book your personal, tailored to your sessions, I look forward to meeting you and being a part of your transformative journey. I can come to you, either in downtown Toronto or Muskoka area or you can come to our studio in Gravenhurst. A travel fee will apply to sessions away from our studio. 2 foam or cork blocks, at least one yoga blanket (or something similar), and a yoga strap. A bolster and eye pillow can be really nice too, but not essential. Please email me if you have questions about what kind of mat or props to buy. Or we can meet at a studio in downtown Toronto where they will have all the accoutrements for you to use. A space rental fee will apply. Yoga is a physical, mental and spiritual practice used to bring one to an elevated awareness or consciousness. Whether you are new to the practice or have been practicing for some time, I will work with you to find a practice that is suitable for you and where you are at, encouraging you to a place of vitality and mobility. I bring a compassionate and gentle presence to each class and enjoy sharing the beauty and wisdom of yoga. I offer classes in Yin yoga and Ashtanga based vinyasa flows. Focus on breath, being present in the moment, and alignment that is suitable for your individual practice. Yin yoga is a slow paced practice, with postures that are held for 3 -5 minutes in mostly seated or laying down positions, allowing the body to slowly release tension and penetrate the deeper connective tissues (tendons, fascia, and ligaments) as well as the energetic systems of the body, bringing the body into balance and increasing it’s natural range of motion. Yin yoga improves flexibility, circulation in the joints, the flow of qi; the subtle energy that runs through the meridian pathways of the body, which in turn helps improve organ health, immunity and emotional well-being. With this practice you will feel refreshed, renewed and restored. The yin yoga session can be interspersed with series of more active yang poses for a Yin/Yang session. 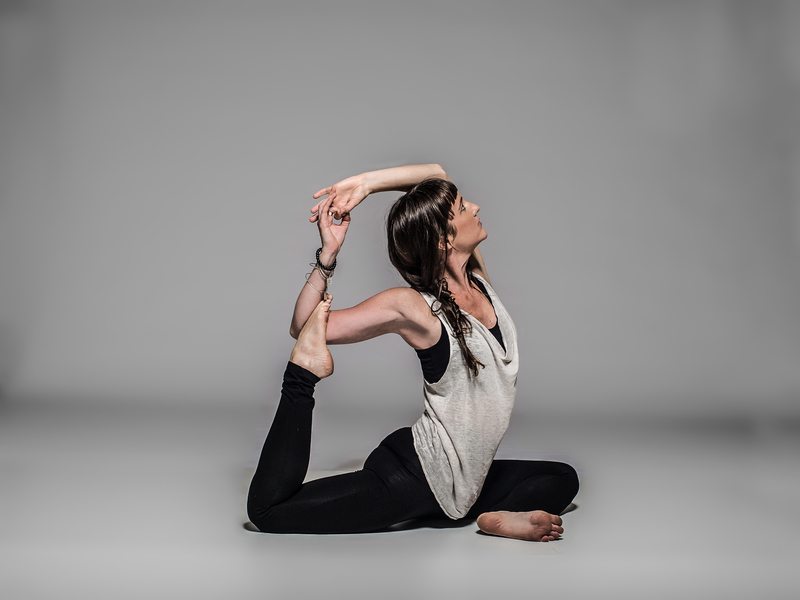 Yang yoga is more actively paced and in this class we will be practicing an ashtanga based vinyasa flow, using a series of postures to align movement with breath. The yang style removes stagnant qi, strengthens and increases stamina. Ashtanga practice begins with Surya Namaskar A and B, followed by a standing sequence, then seated sequence followed by the closing postures, aligning movement with breath, removes stagnant energy, strengthens and increases stamina. I find yoga not only nurturing for the body but also the mind and the spirit and feel truly grateful for the opportunity to share this practice with you, meeting where you are in life, helping you find balance and well being in life. Let’s go on a journey, send me an email at info@zennomad.ca to discuss your needs for an individualized program.